It’s an elusive thing, beauty. Artists and scholars have devoted forests of paper, kilometres of canvas, gallons of paint – not to mention years, and often lives – to defining and capturing ‘the beautiful’. Is a litter of mutant babies beautiful? How about a single babe with flippers instead of feet, an elephant’s trunk instead of a nose? Or a twelve-foot nest of human hair in which furry, antennaed witchetty grubs (each the size of a well-blubbered walrus) sleep their sluggy dreams while a young boy kneels on their slumbering backs? Surrogate mother-creatures, with endangered species nestled in the flesh of their rumps? Young children playing with stem cell blobs, or enveloped in the embrace of a genetically-modified nursemaid, or supporting the heavy head of an exhausted mer-grandparent? Patricia Piccinini’s sculptures are unsettling, grotesque, sweat-and-hair-excrescent, hyper-real impossibilities — and they are so very, very beautiful. Cutting straight to the most vulnerable facets of human society — newborn babies, young children, nursing mothers, careworn elderly — Piccinini explores the implications of controversial issues like genetic modification, stem cell research, and the human impact on the natural world, and shows (without moral judgement or even a whiff of preaching) what might be. What could be. 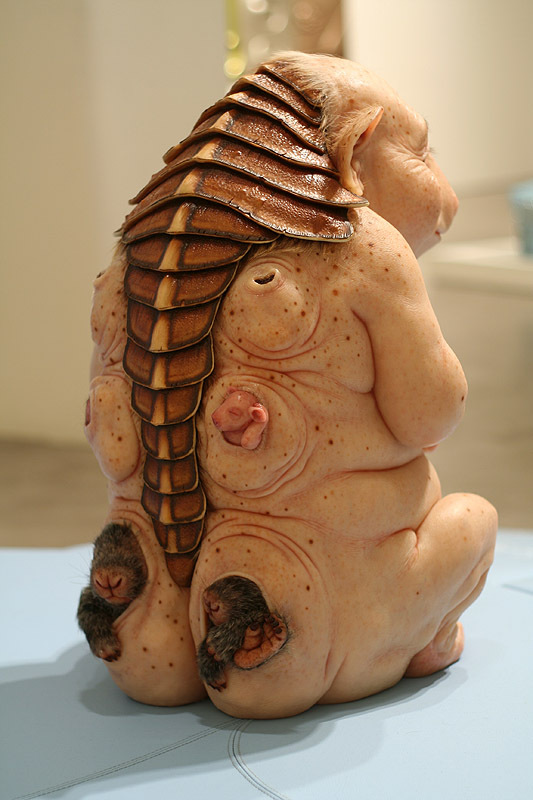 The future according to Piccinini is horrifying. It is, nevertheless, touchingly human. The pieces evoke so many emotions, so many concerns, so many uncertainties — and yet, or as a consequence, they are inspiring. Breathtaking. Twenty-first century beauty. Dr Chad and I visited Piccinini’s ‘Once Upon a Time…’ exhibit at the Art Gallery of SA yesterday, and I cannot stop thinking about it. I haven’t been so moved by a collection in years. I’ve admired exhibitions. I’ve been impressed by the Victorian painter’s skill, the medieval sculptor’s eye for line, weight, translucence… But while the gorgeous Pre-Raphaelite canvases I adore so much give me goosebumps (the colour! the draftmanship! the detail – oh so much detail!) and they often spark stories in my mind while I look at them, Piccinini’s vision has beguiled me. I did not want to leave the perfectly-lit basement of the Gallery; I never wanted to stop looking at these awful-wonderful creatures. In my world, beauty can be medieval, Pre-Raphaelite, magical. There are grand rooms filled with tapestries, flying ships, enchanted jewels, sinister witches out for blood. But it is also home to dark woods, decaying cities, and disturbing-beautiful creatures like Piccinini’s. If you’re in Adelaide before June 26, you can behold these wonders for yourself at the Art Gallery of SA. 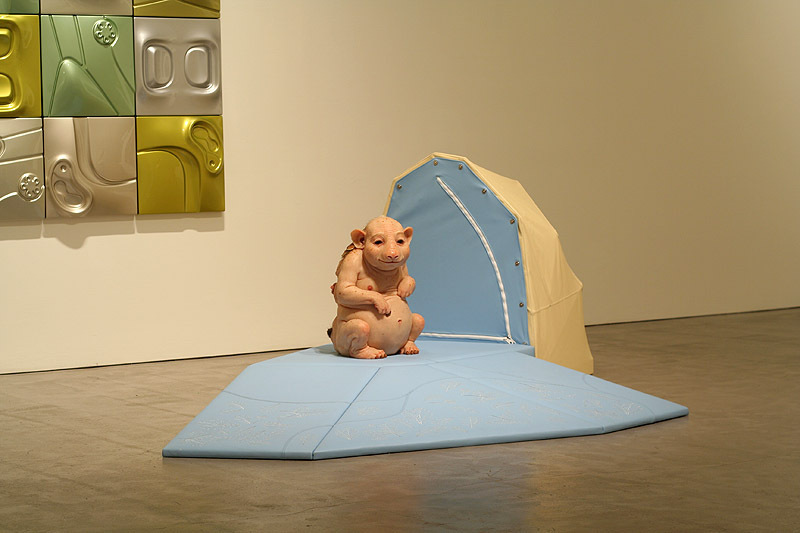 Tags: art gallery of south australia, beauty, genetic mutation, gushing about art, patricia piccinini. Bookmark the permalink. Previous post ← Holy. Crow. It’s all happening.